Team Publishing enables you to assign an article to an agent and add an internal note. This is useful for making a team member responsible for updating, reviewing, approving, or publishing an article. You can only assign an article to an agent who has permission to edit the article. You can add an internal note to the let the assignee know what is needed. You can reassign articles as needed, as they move through the various article states in the workflow. When you assign an article to an agent, that agent receives an email notification with a link to the article. Guide Managers can view all of their assigned articles in an article list. Users who are not Guide Managers cannot view article lists, so they need the direct URL to access the article. You must have Guide Enterprise to assign articles using Team Publishing. You can assign an article to any agent who has permission to edit the article. You cannot assign articles to end-users. You can add an internal note on the article to the let the assignee know what is needed. If you need to assign multiple articles at once, see Updating knowledge base articles in bulk. Click Assign in the right panel of the article. In Select a team member, start typing to search for an agent or select an agent from the drop-down list. You can only assign the article to an agent who has permission to edit the article. If you select an agent who cannot edit the article, you'll see a message indicating that you cannot assign the article to that user. In What's the update, enter an internal note. The agent will receive an email notification with a link to the article. Guide Managers can view a list of all their assigned articles. Users who are not Guide Managers cannot view article lists, so they will need the direct URL to access the article. You can reassign articles, as needed, as they move through the various article states in the workflow. When you reassign an article, you can update the internal note. The note history is not retained. When you reassign an article, the new assignee receives an email notification with a link to the article. The previous assignee does not receive a notification that the article has been reassigned. 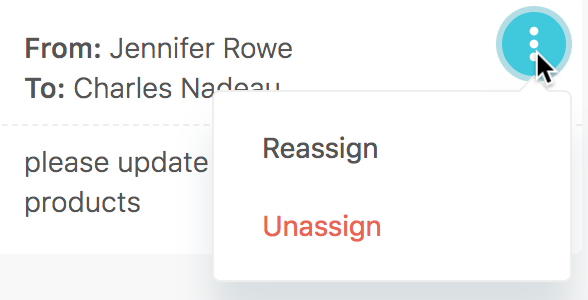 Click the options menu beside the assignment, then select Reassign. In note box, enter an new internal note. It is not possible to retain a notes history. The new note will overwrite any existing note. The new assignee will receive an email notification with a link to the article. The previous assignee does not receive a notification that the article has been reassigned. Guide Managers can view all of their assigned articles in an article list. Users who are not Guide Managers cannot view article lists, so they will need the direct URL to access the article. Hello, is it possible to assign an article to an end user (requester role); or is it only restricted to agents ? If yes, is it even posssible for an end-user to create a draft content ? The question seems weird, but it could be usefull in our case: we have internal workflow documents in our comapny, involving several other teams (end users, not agents). Such a possibility could let them fill a document with various informations and then make it finalized by an agent in order to process one or several tickets related. Articles can only be assigned to agents, so you won't be able to put together that workflow in Zendesk. Google Drive is a great collaboration tool that could work, though. Then your agents can just copy/paste the content when it's ready and publish. I've updated the article to make it clearer that articles are assigned to agents, not end users (and only agents who have permission to edit the article being assigned). Thanks! Owner - this is the person who is the owner of your Zendesk product account. This may or may not be the same as your Admin. Admin(s) - these folks have permissions to do pretty much anything you need in your Zendesk product instance. They manage permissions, can customize things, etc. Agents - this is the next level down from Admins, they have the ability to do some things but not others. This is typically going to be your employees, such as your support team or writers. End-users - your customers. They can't do anything but file a ticket with you. I hope that helps clarify things. Let us know if you have further questions! I need two lists of articles. I need a list of articles by assignee and another list by author. I was hoping to get this list from the manage articles screen. I do not see a way to easily get this information. The only way I see to the get the information is to click into each article. Is there an easier/quicker way for me to get the information? I am using Guide Enterprise.